Thanks last year Siskins and Bramlings but none this year .Yes Deida fruit their favourite and he/she had demolished a few apples before coming for a closer look. We get them in the Rowan tree opposite, had some today ! Fantastic, you certainly have the camara out at the right time! Great pic Bonkers. I ahve been watching the Redwings at work. Trouble is I try and point them out to others but they are so sceptical as they have never heard of them. Has to be a favourite, BB. Lovely, lovely little bird. Lovely little bird...not seen one before. I haven't seen any in our garden , but with weather like this they might come in ! Thanks Jacque - you may well get to see some too if this weather continues. Aye Toto - fancy doubting you of all people .Never heard them must equate to they dont exist then in some peoples eyes. Thanks Louise .. he he OG well wouldnt want to bore you with all the rejects . Apparently flocks do visit the west side of the country from Iceland and Greenland so you might get some PG. Winter visitors change Amy and they may well do last year we had Siskins and Bramblings but none this year. Oh Bonkers youve done it again.....brilliant photo....gone on my favs. Pp..theyre just slightly smaller than a song thrush.Love their markings ! Will be ready with the Apples! Not seen any up here so far but when we lived down the road there used to be a flock of them visit the holly and yew trees. A beautiful bird Bb. I've never seen one of these. Bb, i've just seen my first Fieldfare in 3 years, i'm chuffed to bits !!!!! Do you get them there too, they seem to be around when the Redwings are around. Louise..Lucky you ! Have only seen one Fieldfare in the garden and funnily enough at roughly same time as our visiting Redwing.They usually seen in flocks but think hunger drives them into gardens ! You DO sound excited !! It's the little things Bb ...... ! I know ! !....The things that cost nothing too ! 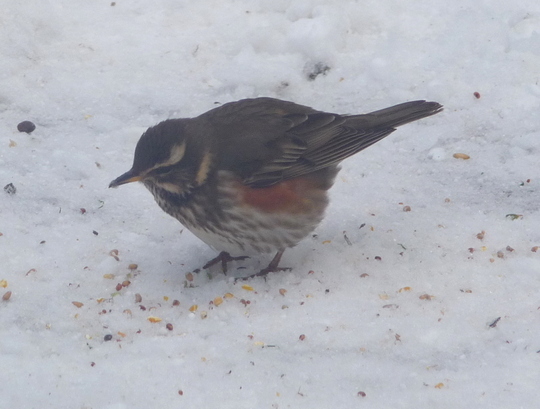 A lovely picture of a Redwing. The Redwing and Fieldfare were reported to be all around the Wirral today. and one of my pictures of the Fieldfare is shown on the Dee website. What a little beauty, and what a privilege for you. I will add this to my gallery Bonkersbon. Thank you Faerieflora...just glad that had just put out fresh supplies of apples a few minutes before ! Fantastic photo RayJane, not a regular visitor to my garden, you did well to catch it. Thanks Dawn...only the second time seen in our garden too ! Ate lots of apple then as well. never seen one in real life,great pic thanks for sharing! I saw a few in the hawthorn hedge up the road when I was walking Bonnie this morning. I suppose the cold weather is bringing them in to feed. Hi Dawn...had a Fieldfare in garden today,along with the Redwing.They were demolishing apple halves ! Absolutely freezing cold here..with an icy wind.Brr..
~ same here BB~ never seen them before~were with Fieldfares and Mistlethrush~ spent all day watching them feed! Not surprised Arlene...very pretty birds arent they ! ~lovely and so big!particularly the MIstlethrush who spent all day eating apple halves too! Fieldfares too..a handsome bird.Lots are arriving as noticed many Goyers are getting them !